What happens when you combine some of the best features from a top-selling family sedan with those of a top-performing crossover? 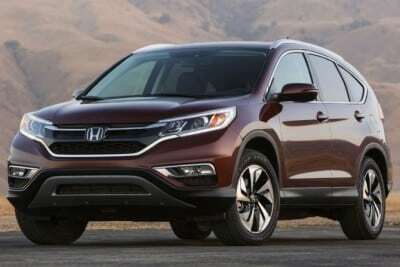 You get my tester for this week – the 2015 Honda CR-V. 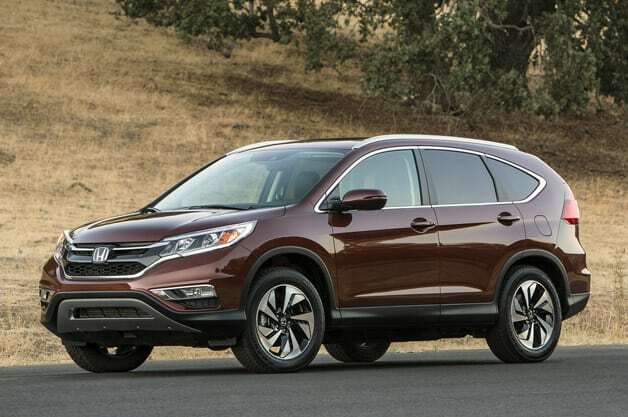 This model year the CR-V will borrow a lot from its stable mate, the Honda Accord. These two stalwarts now share the same engine and same transmission (which helps Honda save production costs). 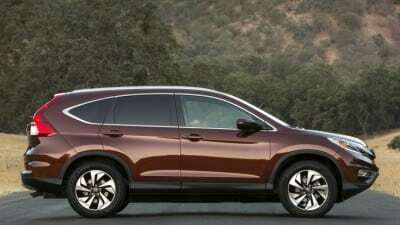 Beyond that, the 2015 CR-V has other new features including a refreshed exterior, upgraded interior (including rear climate vents) and Honda’s new flashy, but gimmicky blind-spot monitoring system (which uses a camera to show who’s in the passenger-side blind spot). The CR-V is one of the most distinctive (and common) crossovers on the road today. You can see various generations of CR-Vs on any highway in America. So it was important that Honda not mess with the winning formula too much. Judging from my team behind the wheel, the recipe for success continues for the CR-V. Without going too frilly or being overstylized, the 2015 CR-V offers some subtle exterior updates including a handsome change to the headlight framing. The side panels also are given more style. The back end is more squared off. This overall blocky look somehow works congruently with the overall flow of the rest of the CR-V. The big news for the 2015 CR-V is the new engine. 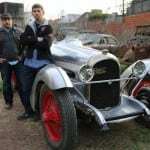 Well, it’s not really a new engine, since the 2.4-liter direct injected four-cylinder engine has been used in the Honda Accord for a couple years. It’s now going into the CR-V as well. Hearing that a car’s engine is going to power a crossover may sound like a drop in power will accompany such a change, but the CR-V actually improves slightly in torque output. With the Accord engine, the CR-V makes 185 horsepower and 181 lb./ft. of torque. 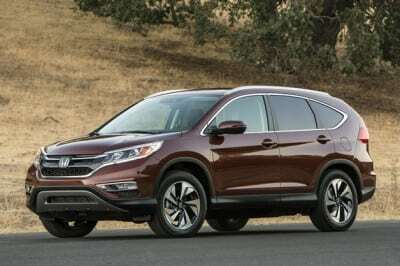 Additionally, the CR-V will share the Accord’s continuously variable transmission (CVT). Now, for those who have read my reviews in the past you’ll remember my general disdain for CVTs. However, with this CR-V, I found the transmission to be acceptable. It seemed to work well in concert with the new engine and I rarely noticed the stutter between shifts. As far as CVTs go, this one is acceptable. The 2015 Honda CR-V comes with both front-wheel drive and all-wheel drive. My tester had all-wheel drive. For snowy roads, I always prefer AWD, and even in plain road conditions, I like the way AWD vehicles handle. 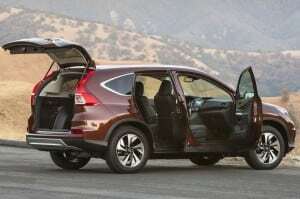 One of the big appeals of the CR-V is it’s the true definition of a crossover. It drives like a car (even more so now) but offers a higher driver’s vantage point and comfort of a SUV. Additionally, the CR-V has vast amount of passenger and cargo space. Inside, the CR-V sees an improvement to the overall material qualities. This was a much-needed change for this crossover. Rear passenger vents are added, as is a new center console with armrests. 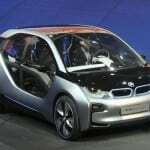 A seven-inch touchscreen now powers the infotainment system, which is average when compared to other such systems. The infotainment menu layout can be confusing and needs to be more intuitive. Cargo space is plentiful. Behind the second row seats is a deep cargo well (thanks to that aforementioned boxy back end) with 35.2 cubic feet of space. A simple process of folding the rear seats down reveals 70.9 cubic feet of space. The five-passenger CR-V has four trim options, including LX, EX, EX-L and Touring. My tester was the top-of-the-line Touring trim. One thing that is a constant for all Honda vehicles is there’s a significant difference between the basic trims and the top-tier trims. 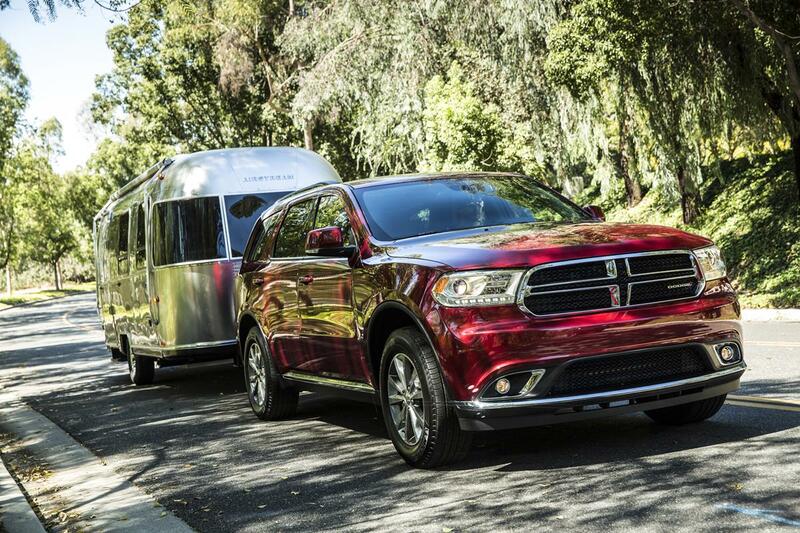 The Touring trim is where many of the creature comforts and near-luxury options begin. 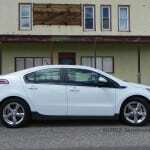 But there’s also an $8,000 price difference between the LX and the Touring, so niceties like a power liftgate, adaptive cruise control, and driver seat memories are only available on this trim. 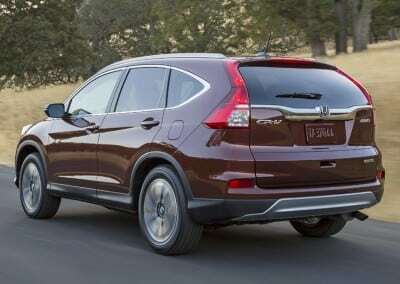 With the new (to it) engine, the CR-V has a three-mile per gallon improvement in its fuel economy. 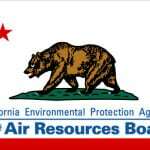 The FWD CR-V has an EPA rating of 27 mpg/city and 34 mpg/hwy. 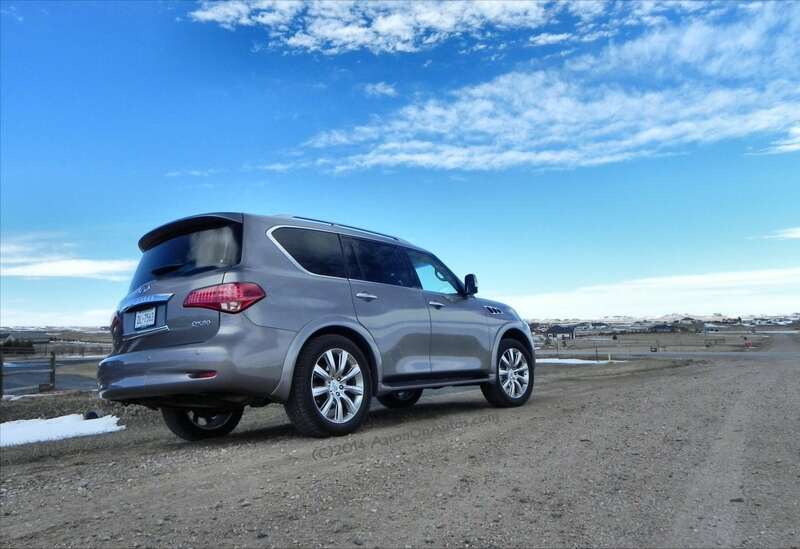 My AWD tester drops down by one MPG but still offers a noticeable improvement year over year. In a week’s worth of cold-weather driving, I averaged an impressive 28 mpg. Pricing for the CR-V starts in the mid $20s, but my tester had a final MSRP of $33,600. 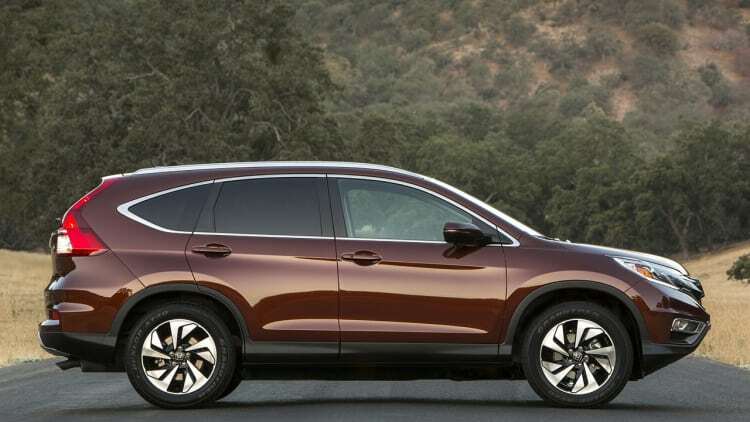 For years, the Honda CR-V has been the gold standard for crossovers. Honda’s recipe for success was simple. They approached changes and modifications slowly and conservatively. They didn’t want to mess with a good thing. So putting the Accord engine and the Accord’s CVT transmission into America’s top-selling crossover was somewhat of a gamble. However, having driven the CR-V for a week, it’s a gamble that paid off big time. The 2015 BMW 1 Series: Should You Buy One?